celebrate the boy… with help from grandpa | happy stuff. isn’t it great?! i’m hoping to get around to painting it sometime, but it works just fine as-is. the idea is that it’s safer than letting baby dude stand on a chair or a stepstool (less likely to tip or fold up on him, he can’t crawl down (or up) by himself… which i may regret later but for now is priceless) but still puts him at counter-top height so he can see what’s going on. for the most part, he seems to like it and is content to stand there instead of insisting that i hold him in my arms while trying to chop onions or stir boiling liquids. we put felt bumpers on the bottom so that it slides around the room easily if i need to move him (baby dude also enjoys pushing it around when he’s not inside it. 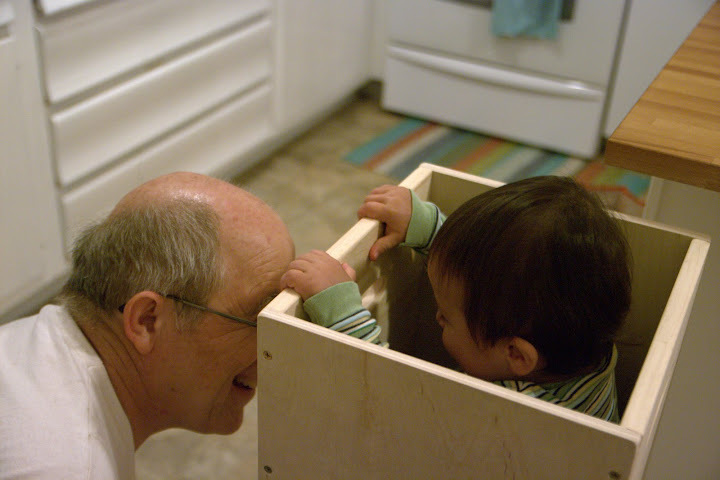 also, he loves tossing things into the box–refrigerator magnets, snacks, his bottle….). thanks, dad! i’m sure we’ll get lots of use out of this piece of furniture and it’s so much more meaningful since it was built by his grandpa! update: you can see the final painted version here! 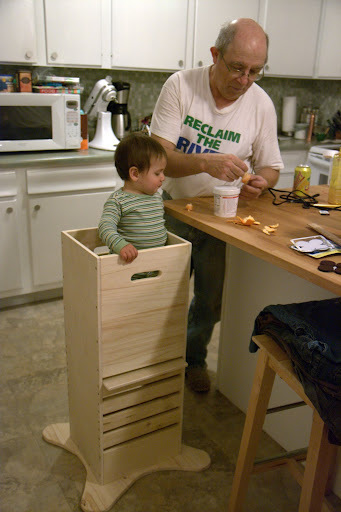 This entry was posted in baby stuff, crafty stuff, stuff that makes me smile. Bookmark the permalink. What an amazing idea! And your dad made it look so good! Hi! I saw your dad’s funpod a couple of weeks ago and couldn’t take the idea out of my head. I HAVE TO DO THIS!!! My 2 little girls (10 months and 2.5 years old) would be thrilled with their own custom Funpod so I was wondering if you had a plan or if you could provide me the measurements it would really help me getting started. Can you please tell me the size and the mesures of the box. Thank you very much. the “petals” at the bottom appear to have been cut from a 20″ square board. 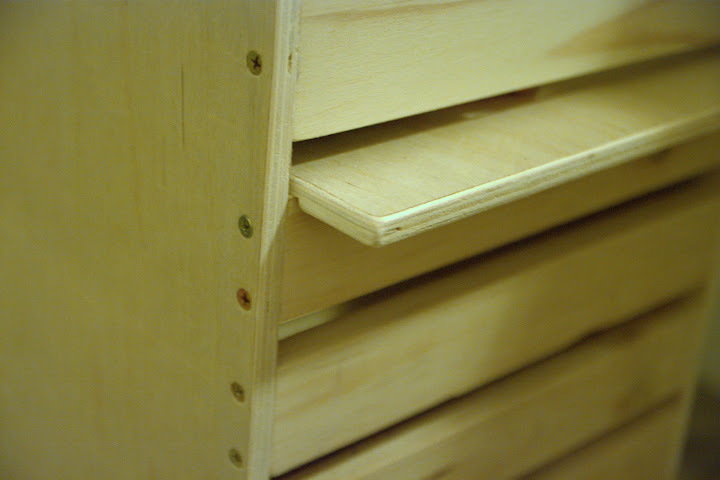 it’s constructed with straight-butted joints (don’t know if that’s the official woodworker’s term, but they’re not mitered) and the shelf has inch-wide notches on the bottom side that line up with the slats that it rests on. I won’t swear by the safety of this “funpod” for every child, but it’s been fairly tip-proof in our household so far, even though he now occasionally attempts to scale the outside of the box. Just remember that for ultimate safety, the platform they stand on should always be positioned so that the top of the box is about at armpit level. I’d love to see photos of your versions! This is so cool, especially since someone in the family made it. Wish I had one when my kids were little and “helping” wash dishes in the kitchen sink among other things. Haven’t look at the painted version, but, after reading that the little guy was putting things inside it, I thought that painting it with magnetic paint and/or chalkboard might make it even more fun. This is a GREAT idea!!! My 4year old munchkin is very much in a “I want to see” phase and has nearly given me a couple of heart attacks by nearly falling out of a kitchen chair. I’ll have to figure out how to make one of these that is mobile-home friendly, I.E. Foldability or make it easy to disassemble. Thanks for the inspiration. hi there! love this so much! my dad and I are making one for each of my siblings and their littles for christmas! we’re just stuck on what kind of wood you used. it looks almost finished? i know this DIY was posted a while ago, hoping you still might be able to remember and respond! thank you so so much! so thankful for the idea + measurements! I’m pretty sure it’s just plywood (the edges have that tell-tale layered look). Good luck with your project! I just love this! But no handy people around. Can i buy it somewehere! Thanks for the inspiration. Just finished making one today, and my dude loves it! Plan to paint with magnetic paint and chalkboard paint. So we can stick magnets to it (my fridge isn’t magnetic) and draw on it. Thanks again!